I will be charged under The Sedition Act on Friday, 3 April, 2015. My lawyer had just informed me that the police had served a notice to charge me to court under The Sedition Act over my tweet posting dated 10th of February 2015 on Anwar Ibrahim ruling. The charge will be proceeded on Friday, 3rd of April, 2015, 9am at the Kuala Lumpur High Court, Jalan Duta Kuala Lumpur. The charge is under Section 4(1) C of the Sedition Act with carries the maximum penalty of three years in jail, a RM5,000 fine [$1,365 US], or both. Previously I was arrested and detained for three days for the same case. During the detention, the police also opened up separate investigation on my cartoon books, Pirate of Carry BN and Conspiracy to Imprison Anwar. I am represented by Latheefa Koya. We implore the world’s cartoon journalists to publish, post and tweet (@ #zunar) cartoons in support of Zunar and critical of a Malaysian government presently intent on suppressing journalistic free speech. We demand that all charges against Mr. Zunar be immediately dropped. 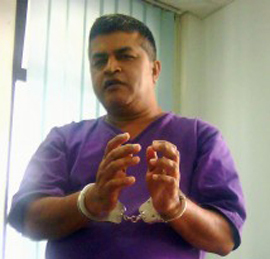 On 6 November 2014, three of Zunar’s assistants were arrested and taken to the police station for selling his latest cartoon books. A few days following, the webmaster, who had been managing Zunar’s website and online bookstore, was called by the police for investigation under the Sedition Act. The action was extended to printers, vendors and bookstores around the country — their places were raided and they were warned not to print and sell Zunar’s books in future. The police has subsequently asked the online payment gateway that handles his book transactions to disclose the list of customers who have purchased his books through official website, zunar.my. For the record, this is Zunar’s second investigation under The Sedition Act for cartooning — the first was in September 2010, when he was arrested and detained in the lock-up for two days. In addition, five of his books titled Perak Darul Kartun, 1 Funny Malaysia, Isu Dalam Kartun Vol. 1, 2 and 3 were banned by the Home Minister from 2009 to 2010.